After more than 25 years of relentless hunter-mocking, Mastiff's Remington Great American Bird Hunt introduces Rockford, a hunting dog that won't laugh at your obvious shortcomings. Hunting video games don't get a lot of play here at Kotaku, as I feel they are marketed towards a demographic that doesn't read things on the internet on a regular basis, only hopping online to fire off angry emails to writers who take a lighthearted stab at their computer skills now and then. Why the exception for Mastiff? Sometimes a marketing angle is just too good to ignore. "Here at Mastiff, we felt like man's best friend wasn't getting his due in hunting games," said Bill Swartz, Head Woof of Mastiff. "Our four-legged friends deserve a virtual representative they can be proud of—one who upholds canine values like loyalty, obedience and hard work. Rockford is a great example for aspiring hunting dogs everywhere." Mastiff touts Rockford as a hunting dog that will never laugh at you for missing the birds, rushing off into the tall grass to flush out hiding birds with a joyful wag of his tail time and time again. He's what a hunting dog should be - not a total douche-bag like other dogs we could mention. "Woof, woof, woof, wag, wag, sniff, sniff, woof!" added Rockford. Well said, Rockford. There's a good dog. 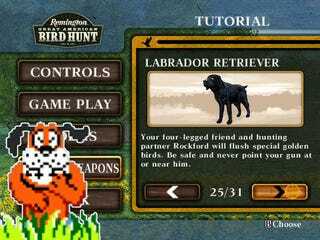 Remington Great American Bird Hunt is now available for the Nintendo Wii.